Fourteen-year-old Josh Anvil doesn’t have a promising future. His dyslexia prevents him from achieving academically, and his dad’s recent injury from a terrible arson fire threatens his family’s livelihood. But when Josh makes a fateful canoe trip in the family swamp, his life changes forever. After drowning in the dark cypress waters he is brought back to life by an otherworld power. Soon he discovers his ability to create living things, and he can heal the sick. But with strange arson fires erupting all over Baton Rouge and a mysterious threat targeting his life, Josh must find the connection. And he can’t learn this from high school. 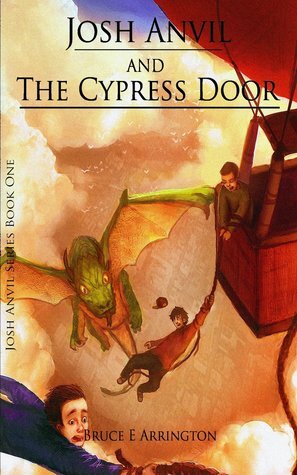 Weaved in YA fantasy with elements of action and comedy, Josh Anvil and The Cypress Door captures the trials of a high school freshman with powerful abilities at his command. Did you ever play the “What If” game as a kid? You and a friend sitting around letting your imagination run wild, creating worlds and creatures. Inevitably it turns into a storytelling session where you feel like you are in the world you created. It’s an exhilarating feeling. In Josh Anvil and the Cypress Door you get that same feeling. Set in a suburb of Baton Rouge, Louisiana, Josh has to understand his powers very quickly. During a showdown for champion in the StoryTellers Club, Josh accidentally creates giant spiders when telling a Louisiana myth. He chalked that up to a weird coincidence. It isn’t until he accidentally creates a dragon that burns down the cafeteria does he realize what he can do. He soon learns that he has to be very careful when he speaks. Besides the spiders, dragons, horses, and cats and mice, he creates 5 teen girls with the peculiar names Chloe, Zoe, Doe, and Floe. All his creations to help him in some way and are at his beck and call. This story is action packed as Josh and his best friend Troy escape police, bullies, aliens, reporters, and the government. I like reading how the character uses his imagination to create beings and floating islands to enhance the lives of those he cares about. He even creates a safe haven for his creations. He truly cares for all his creations. I also like that this YA story has a strong parental presence. In most YA books, children and teens with no parents are trying to save the world. But Josh and Troy have parents who love them and are there to guide and protect them. Josh and Troy still make foolish decisions but that’s what kids are supposed to do. Their parents are there to discipline them when they do. Besides the main plot of Josh’s creative powers, there are subplots of arsonists destroying the town, bullying, and teen love. My favorite subplot is Josh using his powers to heal. As a punishment for using his powers in the wrong way, he is tasked with going to the hospital (a place he loathes) to heal sick and dying kids and adults. Josh is scared and worried at first but he soon realizes that he is helping people and seeing the grateful look on their faces is all he needs. However, the reader does learn that when Josh heals someone he is giving a piece of himself to them and those people start developing powers of their own. I am hoping the rest of series goes deeper into this plot line. Why were the aliens trying to burn down the town? I never understood this. What was the point of creating a Confederate soldier? Was it just to get him into detention and bond with his music teacher? Was it to bring in the old adage, “with great power comes great responsibility?” Was it so he would be punished and sent to the hospital to heal people? The author could have come up with a better way to accomplish the end result. This is a great book. The story and the action kept me reading late into the night and sneaking a few chapters here and there while at work. It’s one of those books that makes you want to binge read the entire series in a single sitting.